1. Why is there a need for professional reference screening services? 2. Are there any serious risks in not checking the background of a potential employee or tenant? 3. What should I look for in selecting a professional screening service? 4. How long does it take to get Reports? 5. Can I be sure the applicant's rights, as well as my rights as an employer or landlords are protected? 6. What positions and when should be checked? 7. How can I order a report? The next person you hire or rent could be the reasons for your (company's) success or failure. Knowing an employee's or tenant's background can be the best indicator of their future performance. Most companies' hiring practices continue to focus on traditional screening techniques such as applications, resumes, references, and interviews. Employers and landlords are finding their ability to gather information severely restricted. The most reliable and practical solution is to retain a professional reference screening service. Failure to do so can result in legal risks, a damaged reputation, and financial loss. Reference check is an effective risk management tool that has been proven to significantly reduce the risk of a bad fire. There are plenty of serious risks such as employee theft, crook, falsified application, workplace violence and negligent hiring liability. The new evidence of “negligent hiring” dictates that some facts in an employee's background should eliminate them from consideration for a given position. The first two things to look for in selecting a screening service are credibility and professionalism. Any screening service you consider should have access to and be able to understand a wide variety of data sources. A screening service needs to be able to conduct a check in a timely manner while adhering fully to Personal Data (Privacy) Ordinance. A professional screening service will also have expertise to act as a consultant for you and will be able to advise you on the proper use of the information contained in your report. Your reports will be ready as quick as in 4 hours or less depending on the type of reports and searches. Yes, retrieving the reports with applicant's written permission conforms to applicable regulations. Reference check is not an invasion of privacy and a sign of mistrust. A reference check is not only for the benefit of the company as a sound business practice, but also for the benefit of all employees (i.e. quality teamwork and increase productivity). In fact, most positions should be checked before making hiring or renting decisions. 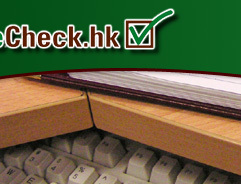 Some employers limit pre-employment check to management and executive positions, professional position i.e. accountant, position of financial trust i.e. banking staff or to positions that have access to cash, assets, a company credit card or confidential information. There should also perform check to employees who are promoted to a new position for added responsibilities or annual employee audit program. You simply fill in the Order Form and Client Applicant Form (for one time) together with copy of Business Registration for the first order. A signed applicant's Authorization for Release of Information Form and relevant forms are required in front of our company's representative. Returned reports will be faxed to your secured area. © 2004 Reference Check. All Rights Reserved.